When I get into a car I want to be wowed. I want to smile and it has to make me feel special even if it won’t buy me dinner and drinks first. I get that feeling when I get into a Golf convertible. The Golf drop top is a MK VI version. The MK VII convertible hasn’t been released yet and we wait with baited breathe for that day. In the meanwhile the MK VI remains as awesome as ever. The sweet little 1.4 twin turbo is as smooth as silk which shifts the Golf along at a more than respectable pace getting to 100kph in 8.4 seconds. Inside, you never feel rushed or panicked because all is calm and serene behind the wheel. Can I make a phone call? Why, yes I can. Can I use the steering wheel buttons easily? Yes I can. Can I find the cruise control and auto wipers? Sure thing! Why? Because all controls are exactly where you expect them to be. There aren’t stupidly complex menus for every conceivable function driving you utterly potty in the process. 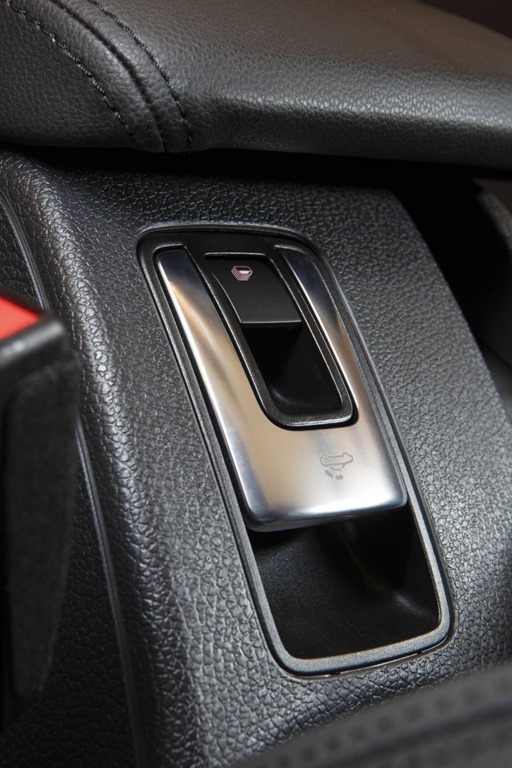 There are buttons and levers and none feels like it will come away in your hand if you use it too enthusiastically. The joy of a convertible is, of course, the roof which opens and closes at will. If, as I did, you head off on a day where the weather comes over all moody and uncooperative, you don’t even have to stop in order to wrap yourself in the cosiness of the cabin. You simply slow to under 30kph and bobs-your-uncle. Gently caress the lever and quick as a flash your open top tourer becomes a cossetted cosy coupe. A single button raises or lowers the all windows and the roof with a push. Of course there is no hard top, but rather an old school rag top with a 21st century twist. A cap and sunglasses are essential. No matter which way you turn you always have the sun directly on you and at times it is hard to see. Lowering the sun visor is as useless as a paper raincoat. Unlike steel roofed convertibles whose rumps are of the fuller figured variety, Golf is trim taught and terrific without losing too much bot space. Unlike a steel roof, fabric roofs have no need of three quarters of the boot being temporarily used. 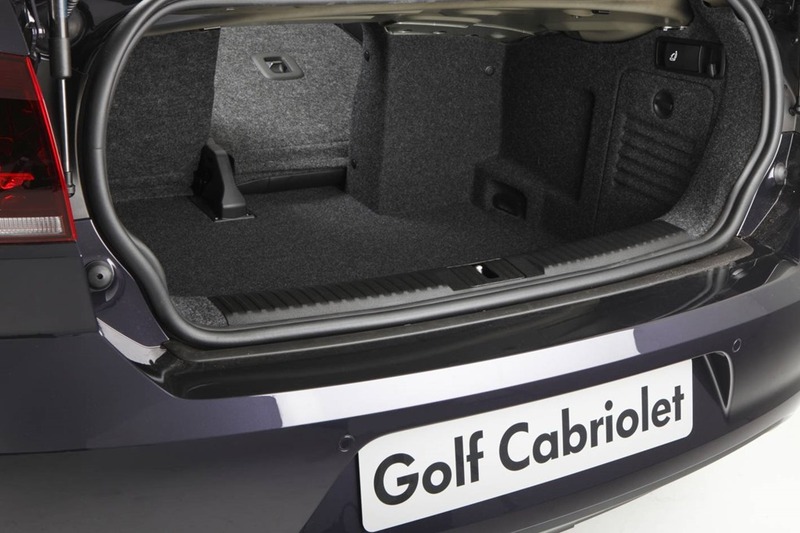 The golf has most of the boot available for shopping bags, all of the time. Only a small section is permanently used for the top. Remember, the roof folds down in just nine seconds, so there is no excuse for getting moist unless you’re having fun doing it. An important issue for most is noise. With the roof up there is little more noise than you might expect in her steel roofed sister. As for road noise, there is little of that either. Somehow VW has soundproofed the cabin in such that you could almost believe you are in a conventional model. Of course the is more noise with the roof down, and even more if you have the windows down as well. If you decide you want the roof down on a warmer day, the cold air does quite a decent job if you have it directed at your face and hands. The exterior is simple and understated, like its owners. The Golf shape has evolved slowly over time so each new model closely resembles the model before. The proportions look good with the roof up or down that’s something that can’t be said for a lot of convertibles. The interior has been with us for a while but still looks crisp. It is classic rather than “fashionable” which means it will age well rather than look old-hat once a new model comes out. Equipment level is as you would expect of a German tourer: You VILL be comvortable, UND, you VILL harv eeverytheenk you vont. The audio unit still has a quaint 6 stacker a cd for those interested in museum pieces, and USB and Bluetooth streaming for the rest of us. The sound is good, not great, but good. The auto headlights, cruise control and wipers are on the steering column stalks and are the best in the business. They are intuitive and dot not require a week trawling through a user guide in order to make sense of them. Use them once and they feel like old friends. The drive is fabulous, not as fabulous as her sister, the GTi, but fab none the less. When you cut the roof off a car, things gets a bit flollopy but most of the time it goes unnoticed. The leisurely spin through the Royal National Park is a joy. 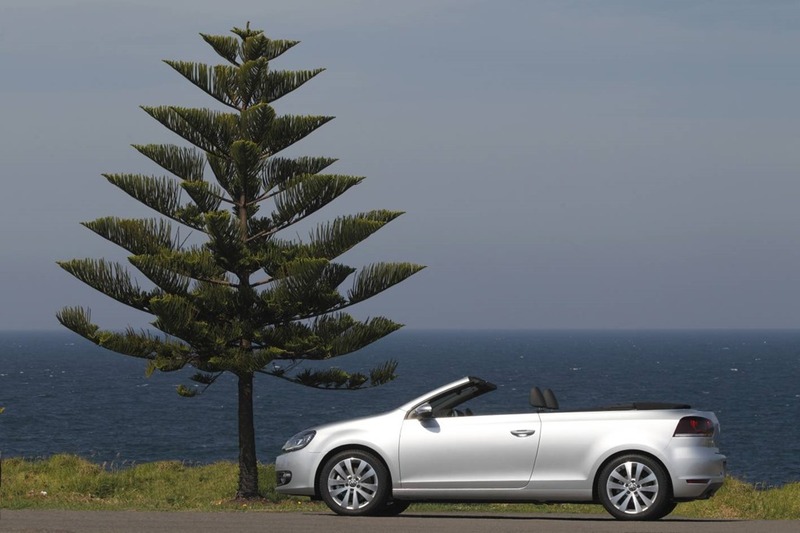 With the top down, you feel part of the scenery. You can smell the forest, then the fresh sea air. The sun, filtered by the canopy of green, dances through the cabin like your own personal laser show at Arq. Little flashes of shadow and light bombard your senses feeling almost trance-like. It’s as thoroughly invigorating as a dip in an alpine mountain stream. It’s only when you push too hard through a bend that understeer kicks in and the dream dream state becomes shaken not stirred. The car feels like it wants to keep going straight ahead despite the stability control. It is because of said control that you don’t spear off into the bushes. If you aren’t expecting it, it can catch you unawares. Most of us will never feel this unless we are being very naughty, so don’t do it. The ride is limo-like. Only the rudest of bumps disturbs the occupants. 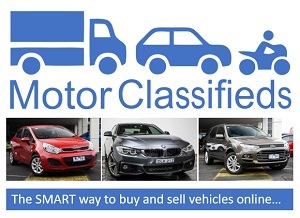 The chassis gives a good balance between soft ride good handling. A firmer suspension setting might give slightly better handling but it usually ruins the ride. In this case, it is just right. Highway speeds disturb your bouffant coiffeur much less than you might expect, even less with the windows up. I know that sounds like you are putting a brolly up in a cyclone but it works. The windows are just enough to spoil the worst of the wind, and indeed most of the noise. Even in winter, open top motoring can be had with the heating through both face and floor level vents. This is perhaps the best time of the year because the risk of 3rd degree burns from the sun seems diminished if only a little. 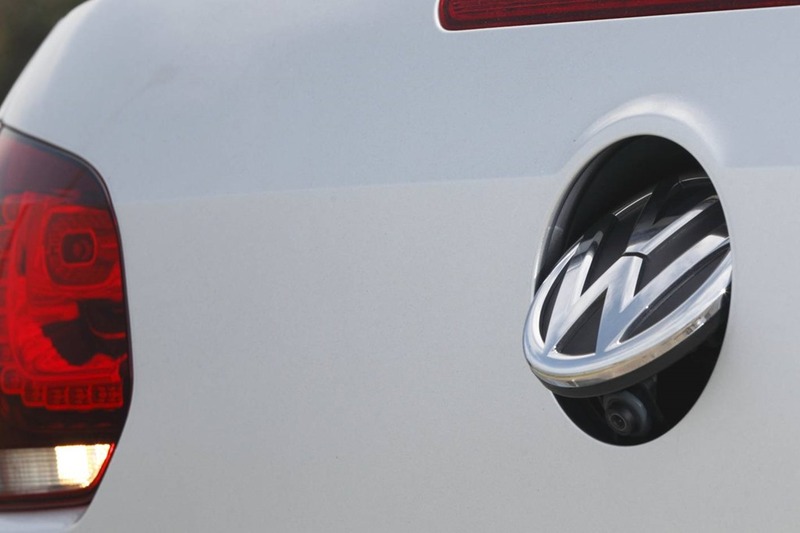 The 118kw 1.4L twin-turbo petrol engine is almost without vibration. It as smooth as a nut and so quiet that most of the time you’re not aware it is running. It is also very economical at a claimed 6.5 L/100k of combined city/country driving. As always I’d rather a manual, but the DSG does the job. It’s a 7 speed auto and most of the time it is smooth, but low speed work needs a bit of care. Crawling into a small parking spot means the double clutch auto seems to grab and release as its clutches go in and out of gear. It takes a little practice to get used to but after a few attempts it feels like second nature. 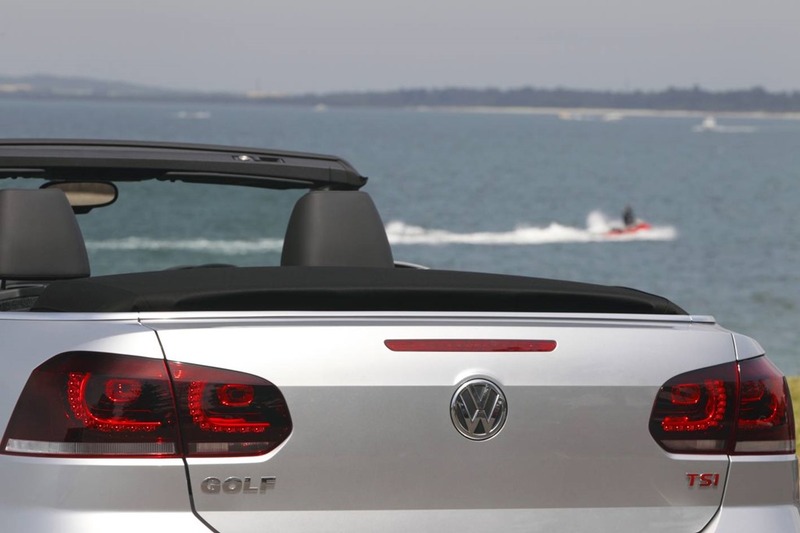 Conclusion: For me, the Golf convertible is the perfect balance between form and function. It wipes the floor with the opposition because there is little or no opposition in the under $50,000 range. You’ll need to shell out many more shekels for a better handling rag top, but remember, the Golf has four full seats, five if the boys in the back are very good mates. My final test is: can I imagine a couple of boys, a gingham blanket and a picnic basket on board? And the answer is yes. Judicious packing will leave room for Rover as well. Would I buy one? 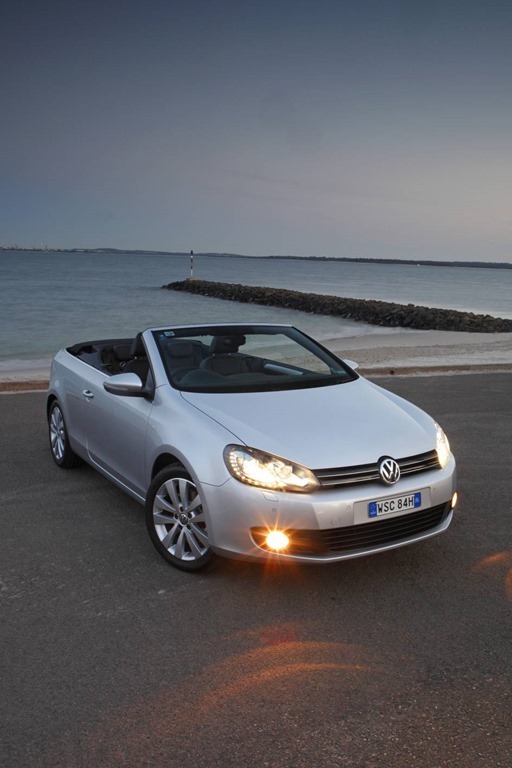 Yes, the Golf remains my pick for an under 50k cabriolet. GT touring without the GT price.